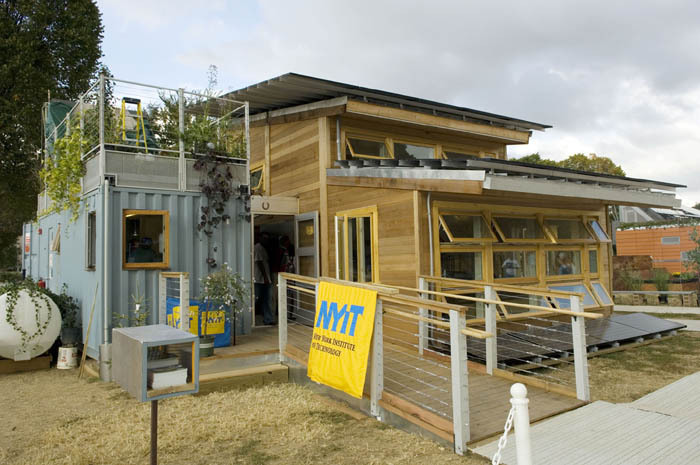 New York Institute of Technology (NYIT) was chosen to be one of 20 teams represented at the 2005 Solar Decathlon. The Solar Decathlon is a United Stated Department of Energy (USDOE) sponsored event where student designed and built homes are showcased on the National Mall in Washington, DC and judged in ten categories based on architecture, energy performance, and affordability, among others, all while using energy exclusively from the sun. NYIT’s 2005 entry, “Green Machine and Blue Space” was named based on its configuration, which relates to a traditional Dog-Trot house. 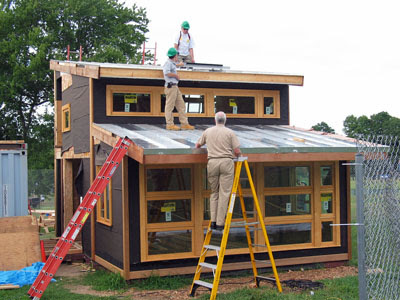 The “Green Machine” is an up-cycled shipping container that contains all the working parts of a home and could, in theory, be used in any location to serve any building or function. 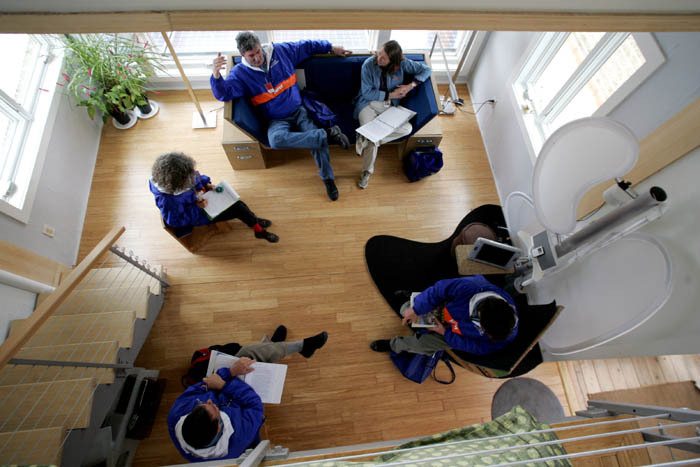 Alternatively, the “Blue Space”, which contains the homes living and sleeping spaces, is intended to be regionally adaptable. 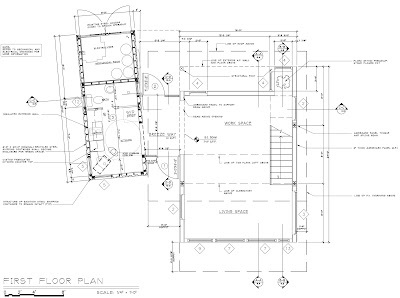 The built design was created for the North Eastern United States, which is the permanent location of the home. 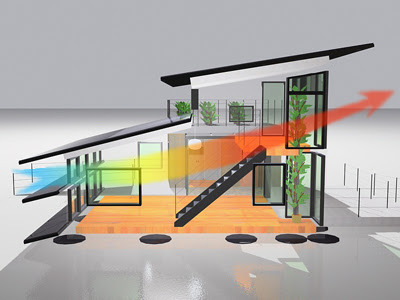 Both the “Green Machine” and “Blue Space” are linked by the “and” a small breezeway that contributes to the homes natural ventilation strategy and brings in daylight. While the "Green Machine" was built using the shell of an old shipping container, with new soy based spray foam insulation to provide an efficient building envelope, the "Blue Space" took a different approach. The living space was built using Agriboard, a Structurally Insulated Panel (SIP) system using only agricultural products. Meanwhile the "and" space was constructed largely of glass. Within the space was an energy storage system used by no other teams in the competition. After completion of Construction Documents the student team built the home on the Westbury, NY Campus of NYIT where it was able to work out some kinks and make final decisions before moving the house to Washington, DC for the competition. 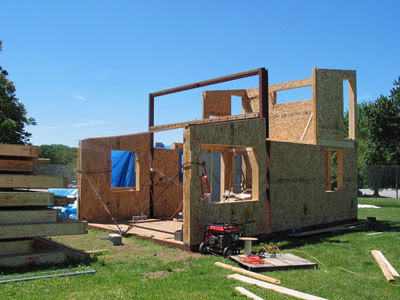 The house was broken down into six separate modules and transported by truck for the two week competition. During the competition the NYIT team scored third in the Architecture competition, where the judges noted how the house "got it right" The system works by producing Hydrogen on-site using an Electrolyzer to convert water into its elemental components: Hydrogen and Oxygen, then collecting the Hydrogen for use later in the day an releasing the Oxygen. When possible all electric loads used energy coming directly from the sun, when this wasn't possible, due to increased loads or lack of sun, the stored Hydrogen was used in a Hydrogen Fuel Cell, which combines the stored Hydrogen with Oxygen in the atmosphere generating electricity with the only byproducts being heat and water. While this technology had been used in the past it was never before used to power a home. concerning natural ventilation. The team also scored fifth in Energy Balance, an accomplishment given experimental technology used in "Green Machine and Blue Space". Where most teams used standard lead acid batteries to store energy provided by the sun for use in the evening the NYIT team decided to explore a different route and selected a more innovative and less polluting technology. The team decided to use Hydrogen fuel for energy storage. While Hydrogen is a non-polluting fuel which eliminates the highly polluting batteries used in the other homes it is currently a less efficient technology, putting the NYIT team at a disadvantage from the start. 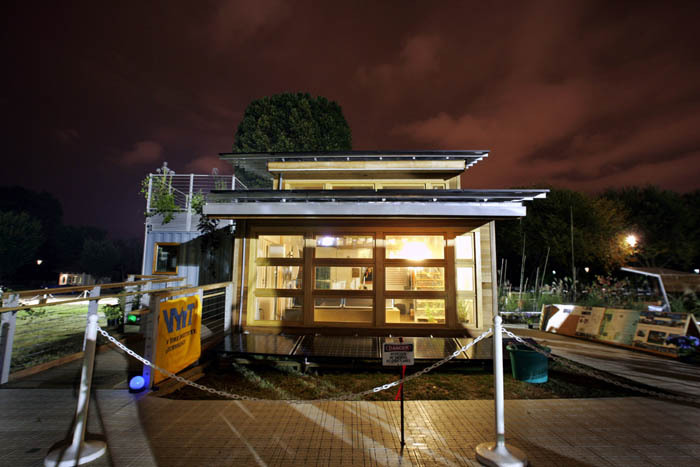 "Green Machine and Blue Space" placed a respectable fifth place overall at the 2005 Solar Decathlon, after which the house was broken down and re-built at its current location on the campus of the Merchant Marine Academy in Great Neck, NY. Read more and see more images at the official NYIT Solar Decathlon 2005 website here, or the official USDOE Solar Decathlon website here.